What on earth is this? That was the first thing that came to mind when I visited Steven Siegel’s studio last spring in Red Hook, New York. The work – new to me -- was not what I had expected, having selected the artist a while back as the Rosen Award recipient of the Twelfth Rosen Outdoor Sculpture Competition and Exhibition (1998-1999) at Appalachian State University. That award was for his spectacular/anti-spectacular, site-specific work called Squeeze 2, composed of layers of old newspapers stacked within a grove of trees and topped by turf. And now the work he showed me, pursuant to his forthcoming exhibition at Appalachian State, consisted of wallpieces, composed of string, cord, yarn, wire wrapped round unknown armatures and compounded, here and there, with computer parts and in one case an infestation of pristine bottle corks. Unlike the nearly monochromatic, mountainous newspaper accumulations, the 52 sculptures in his series called “Wonderful Life” exploit garish, contrasting, almost pop colors, within indoor scale-parameters. They are, however, not necessarily joyous; instead, I would say, they are both exuberant and menacing. Although thrown off balance for a moment, I liked them a lot. And when Siegel told me what had inspired this complicated series and I did some research, I liked them even more. His “Wonderful Life” series is inspired by Stephen Jay Gould’s book of the same name. 1. Time passes and artists change. But how was I going to explain to others (and to myself) what was apparently a very big change indeed. But the deeper I went the clearer it all became. Siegel should not be a totally unknown entity. He has a page-long list of exhibition credits, and his work has been written about sympathetically in such vehicles as Sculpture Magazine (in a cover-article by the very serious Patricia Phillips). 2. There indeed have been other Siegel sculptures that did not use newspapers. Images began to stick in my mind. Some Cans (2002) used aluminum cans, rubber hose and poultry netting; E-virus (2006) bailed-up floppy disks and compact disks; Did God Make A Worm? (2005) was an indoor piece that employed aluminum body parts from an Audi factory. The latter is particularly important in understanding “Wonderful Life.” It was constructed and displayed indoors and used pre-consumer waste. Because of the student work-crew participation required and the photogenic nature of Siegel’s various outdoor newspaper accumulations, it might too easily be assumed that he is the Newspaper Guy, the Outdoor Guy (in what is now a long tradition of site-specific art), or the Ecology Artist. These kinds of simple-minded classifications, it turns out, do not do justice to the complexity, difficulty, and originality of his art. Rather than merely being of service to the sustainability mandate (which cannot be denied in terms of the pre- or post-consumer materials used), he offers up a critical problematic. But here, before I go on, I need to offer the gist of Gould’s book and some of my own interpretations. Gould’s evolution re-do is based on H. B. Whittington’s 1971 re-investigation of fossils from the Burgess Shale discovered high in the Canadian Rockies. We must now correct the 1909 interpretation that jammed the multifarious creatures -- captured in the 550 million-year-old Cambrian sediment --- into a standard evolutionary tree. It now appears the shale contains at least 15 previously unidentified phyla in addition to the four phyla that survived. Phylum, in case you have forgotten, denotes an even larger category than species. We, like fish and other vertebrates, are in the Cordata phylum. Worms and insects each have their own phylum and so forth. The Burgess Shale creature were given evocative names, such as Opaginia, Emeraldella, Wixwaxia, Nectocaris, Odotogriphus, Burgessia, Canadaspis, and the ever-popular Hallucigenia. The Marrella with its double pairs of spines; the five-eyed Opahinia, complete with nozzle; the spine-walking, sponge-eating Aysheaia; and the Sarotrocercus that apparently swam on its back were all part of the Cambrian soup, but left no descendants. “Because of the disparity of the Burgess Shale and later decimation we must invert the conventional cone of increasing diversity, “ concludes Gould. “Instead of a narrow beginning and a constantly expanding upward range, multicellular life reaches its maximal scope at the start, while later decimation leaves only a few surviving designs.” 3. Gould proposes a diagram for evolution that is far different from the textbook tree. Instead of a tree, we are to imagine a bush or (my image) a candelabra with unequal stems, some longer than others. Many species were cut-off by known or unknown forces, dead-ended by catastrophe, sometimes simultaneously. Gould also wants us to invert the oak tree or convert it into a Christmas tree. Evolution will never look the same. Other deposits similar to the Burgess Shale have been discovered since, implying that what is now referred to as the Cambrian Explosion was global, pre-dinosaur and even pre-horseshoe crab. Why was there such diversity? Multifarious life forms may have come into existence to fill a nourishing vacuum, where competition was negligible and then were later cut off by changed circumstances, not yet identified. But the evolution re-do is not yet fully accepted. The continued resistance to a new diagram for evolution – even on the part of one of Wittingham’s research assistants/collaborators -- is further proof of my sarcastic remark, in regard to art, that diagrams are destiny. An understanding of contemporary art, for instance, is hampered by the use of the evolutionary ladder inherited from biology. A braid is more serviceable and probably much more accurate since it allows us to picture exits, re-entrances and cross-influences among many different styles through time, without imposing a convenient end point, implying that one particular style is historically determined and the inevitable result of progress in art. There is always a danger of applying science to art – or the reverse, as proved by the aestheticised “evolution” espoused by Ernst Haeckle (1934-1919) in the nineteenth century.4. His marvelous drawings of his beloved, one-celled, seabed radiolaria are more stylized than would now be approved, but, worse, his Euro-centric view of the descent of man bordered on racism. Science itself is not removed from cultural contexts. Nevertheless, I am afraid that an irrational allegiance to the evolutionary cone of increasing diversity in biology certainly has to do with the human vice of mistaking diagrams for universal truths, maps for territories, templates for temples. After my visit, Siegel sent me a note stating that he hoped that I left with something to think about. I think so. Siegel’s new series references the astounding diversity of forms of the Cambrian Explosion, but we cannot seal ourselves off from the decimation that followed. Vis a vis, the illustration taboo, Siegel is not illustrating geological sedimentation or the Cambrian Explosion, he is appropriating principles of operation. John Cage, the great American composer and thinker, recommended that artists of all kinds not imitate nature’s results, but nature’s methodology. Preconception equals banality. Hence, Cage’s well-known -- and to some infuriating -- use of chance to generate his musical compositions. This is, I feel, what Siegel is doing and is what unites what might otherwise seem to be a caesura in his body of work. He is utilizing nature’s methodology. However, he has not fastened upon the aleatory but upon the incremental. The accumulations, whether outdoors or indoors, echo minimalism’s simple geometric forms, but with materials, site-specificity, and an ephemerality that would put them more firmly in the post-minimalist category. The wallpieces do not recall such academically avant-garde residue. Placing the academic and the avant-garde in such proximity forces a redefinition of both, but that is not necessary to my larger argument here nor to Siegel’s work. There are more important things to discuss. What is pertinent is Earth Art pioneer Robert Smithson’s fascination with entropy and his use of vast geological time as a touchstone for his Spiral Jetty and the indoor pieces he called Non-Sites. As far as I know, no one has accused Smithson of illustration. There is a difference between inspiration and illustration, between allusion and illusion. Even though they are visually very different, what unites Siegel’s outsized accumulations with his series called “Wonderful Life” is the use of increments that end up creating a larger whole. Deposits of sediment yield strata; deposits of newspapers create equally interesting layers. Tiny changes and sports in life-forms yielded an unprecedented and unequalled variety of fauna during the Cambrian period, 550 million years ago. 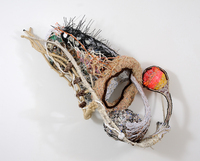 Small changes within the strictures of Siegel’s wallpiece format have yielded a wild variety of novel sculptural forms. Of course, once you let the Burgess Shale demon out of the bottle --- and this is what Siegel has done by naming his series after Gould’s bestseller --- a subject greater than ecology must be addressed. Cubism, some think, tried to deal with relativity. And many artist now, including Siegel, have been addressing ecology. Siegel, however, has tapped what may be the most important art subject of the future, the redesign of evolution or as Gould’s sub-title would have it, “The Burgess Shale and the Nature of History.” I’d also say that he, like Smithson, is addressing time. What could be more abstract than that? 1. Stephen Jay Gould (1941-2002), Wonderful Life. W.W. Norton & Co., 1989. 2. Patricia C. Phillips, “Wandering Through Time, The Sculpture of Steven Siegel.” Sculpture, Oct. 2003. 4. Once the leading Continental interpreter of Darwin, Haeckel (1934-1919) – who coined “ontogeny equals phylogeny” and the term ecology -- is now nearly forgotten, save for his radiolaria drawings. David Lebrun’s “documentary” film, Proteus, A Nineteenth Century Vision (2004), offers a celebratory but uncritical introduction, positioning Haeckel as a spiritual visionary rather than the questionable scientist derided by Gould’s Ontogeny and Phylogeny (1977).